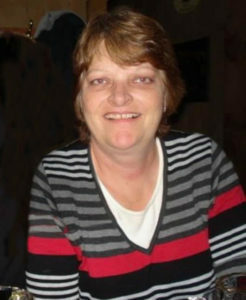 Lori J. McNew, age 61, of Adams, formerly of Milwaukee, Wisconsin passed away Sunday, February 10, 2019, at her home following a courageous battle with cancer. A celebration of life will be 3:00 p.m. until 7:00 p.m. on Saturday, April 6, 2019, at the Wooden Nickel in Grand Marsh. Lori was born June 24, 1957, in Milwaukee. She graduated from Juneau High School in Milwaukee with the class of 1975. Lori married Martin McNew on March 13, 1976, in Milwaukee. They moved to Adams County in 2001 and made many new friends. She enjoyed spending time with her grandchildren, camping, and sitting by the campfire with her son-in-law Derek. Lori was preceded in death by her parents, Orvis & Garnet Brunsberg. We are so sorry to hear of Lori’s passing, she was a great lady. Treasure all your memories of her and remember that we are all here to help you get through the pain. We love you and are right down the road if there is anything we can do. I am so very sorry for your loss. Praying for you and your family. I am so sorry for your loss Marty. You and your entire family are in my thoughts and prayers. Prayers and positive thoughts to you and your family Marty. Wendy and I are here for you if you need us. Marty and Family- I’m very sorry to hear of Lori’s passing. Please know that your school family is here for you and love you. If you need anything please let us know. Hugs and Prayers. So sorry to hear of Lori’s passing, our thoughts and prayers are with you. Marty We are so sorry for your loss. We are so sorry Marty. Thinking of you and your family. Deepest condolences to the McNew family and friends for the loss of your loved one Lori. Find Hope and comfort in Jehovah God’s Psalms 83:18 wonderful promise for the loved ones we have lost in death to be fulfilled very soon by his son Jesus Christ a resurrection back to life for both the righteous and the unrighteous Acts 24:15, right here on a brand new Paradise Earth no more sickness pain or death Life Without End Revelation 21:1-5 jw.org. Loss. Take comfort she is with our Lord. Marty,and Family, sorry to here of Lori,s passing. I enjoyed getting to know her when she worked at SRSTC. My prayers are with you. send our prayers and condolences. Marty, Bob and I are so sorry to hear of Lori’s passing. When we moved up here you were both such a blessing to us. Lori decided what colors to paint every room in our house-turning it into a comfortable home. A fun talented lady, she will be missed. Marty and family, we were saddened to hear of Lauries passing. May God be with all of you at this time and know that she has no more pain and has peace. She was a awesome person. Very sorry for your loss. You two were great together. Marty, Roxanne and I are shocked to hear this sad news- way to young! You and your family are in our thoughts and prayers. Marty and Family, so sorry to hear of Lori’ s passing. Our thoughts and prayers are with you at this time. Marty, my heart pangs with the thought of your loss. I hope you find solace in knowing Lori was loved by many and will be missed, but all are grateful for having known you both. Life goes on and may you find strength in the memories you shared together and all of the friends and acquaintances you met on your journey together. I am so sorry for your loss Marty. You guys were always good to me when I bartended. Lori was sweet and funny, she will be missed😥 May you cherish all the beautiful memories and may they help ease your pain. God bless and my prayers are with you and your family in this time of sorrow. Marty our thoughts and prayers go out to you and your family from our home to yours. She was a very special lady! Our thoughts and prayers go out to you ALL! Lots of hugs too! I’m so sorry for your loss. Sorry for your loss Marty and family ,she will be missed! Marty, so sorry to hear about Lori. We had great times when we saw you guys out. Sorry again. Our deepest sympathy, Marty, to you and the family! Our prayers are with you. Marty and family my condolences go out to you, I’ m so sorry for your loss. Lori will be missed dearly. Thinking of you. Hugs! Your family is in my thoughts and prayers. We had alot of great times together. Lori will be greatly missed. I’m always here if you need someone to talk with or a shoulder to cry on Marty. It’s not an easy road being alone. Many hugs to all. This is sad news. May the Creator bless and comfort you during this difficult time. Marty So sorry to hear of Lori’s passing, she put up a good fight. Please call me if there any thing I can do and always remember the good times together. So sorry to hear of Lori’s passing. She always had a smile when we saw you two and a great sense of humor. Marty, Bob and I are so sorry to hear about Lori. We always enjoyed running into you while doing sign ups. If you need please don’t hesitate to call. You are in our prayers. Oh Marty, I am so sorry. Lori was so funny and full of life. I’m so sad to hear of her passing. So very sorry for your loss. We will miss her. May she rest in peace. So sorry Marty and family. Lori was a good soul and friend. Will be missed. I am so sorry to hear of Lori’s passing. I am so very grateful to have known her. Thinking of all of you. You’re in my prayers.